Size: 10-12 in. high and wide. 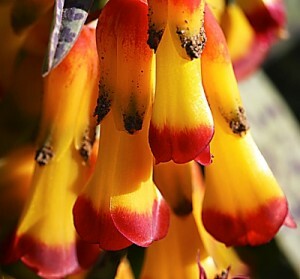 Flowers: Spectacular yellow flowers tipped with red bases and tips last for weeks, late winter-early spring; leaves light green with darker green spots. Uses: Showy winter color, rock garden, border, container, indoor plant. Fire resistive. Soil: Well-drained; does better in clay than sand. Water: Low water before growth; medium water during growth and bloom. Let bulbs dry in summer. Sun: Full sun; some shade in heat; bright light indoors. Pruning: No pruning required. Remove dead leaves as it goes dormant. Pests & Diseases: Generally pest free. Watch for slugs and snails. Notes: When grown indoors, keep in dark until growth starts, then place in bright light. Plant in ground in areas with mild winter and dry summer. One of more than 100 species of Lachenalia. Hardy to 25° F.